Chestnut Hill Hospital ( First Floor Main Conference Room), 8835 Germantown Ave.
Bring the whole family for a free afternoon of fun focused on reading! 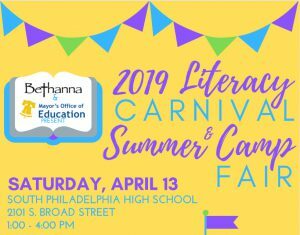 Enjoy carnival games, performances, book giveaways, read aloud, snacks, and the chance to meet with representatives from dozens of local summer camp, youth employment, and education programs. The venue is wheelchair accessible.